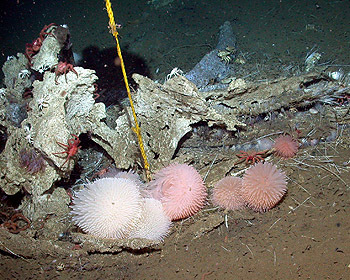 Dead whales that sink down to the seafloor provide a feast for deep-sea animals that can last for years. Previous research suggested that such “whale falls” were homes for unique animals that lived nowhere else. 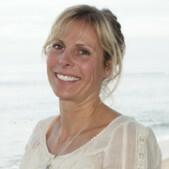 However, after sinking five whale carcasses in Monterey Canyon, researchers from the Monterey Bay Aquarium Research Institute (MBARI) found that most of the animals at these sites were not unique to whale falls, but were common in other deep-sea environments as well. Nonetheless, the whale-fall communities did include a few very abundant animals that were “bone specialists,” including 15 species of bone-eating Osedax worms and several newly discovered species of bone-eating snails. In 2004, evolutionary biologist Robert Vrijenhoek and his colleagues announced the discovery of a new family of bone-eating worms, which they found two years earlier living on a dead whale in Monterey Canyon, almost 3,000 meters below the sea surface. Following this discovery, Vrijenhoek’s team set out to study how these worms survived, reproduced, and spread from one whale carcass to another. To this end, MBARI researchers and marine operations staff hauled five very smelly dead whales off the beaches of Monterey Bay, attached weights to the carcasses, and sank them at different depths in Monterey Canyon. Over the next six years, MBARI researchers and collaborators revisited these whale falls every few months. This long-term, concerted effort involved dozens of dives using MBARI’s remotely operated vehicles (ROVs). 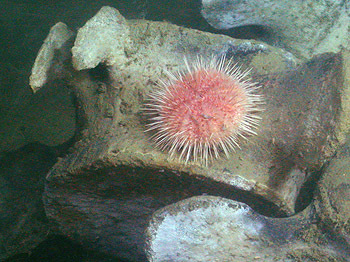 After each dive, MBARI’s video-lab staff identified all of the animals visible in video recordings taken by the ROV, and entered the results into MBARI’s Video Annotation and Reference System (VARS) database. One result of this effort was the discovery of 14 additional species of Osedax worms, as well as new species of anemones, snails, worms, crabs, and other deep-sea animals. At first, this work appeared to support the conclusions of previous researchers—that many of the animals at whale falls were unique. In 2010, however, MBARI marine biologists re-analyzed the hundreds of hours of video footage from Vrijenhoek’s ROV dives. Using the VARS database, the researchers counted all of the different types of animals observed at the Monterey Bay whale falls over the last six years. They discovered that, rather than being whale-fall specialists, most of the animals were “background species,” which were common elsewhere in Monterey Bay. The results of this new research are described in a recent paper published in Deep-Sea Research. The paper was written by MBARI biologist Lonny Lundsten in collaboration with Vrijenhoek and six other researchers. 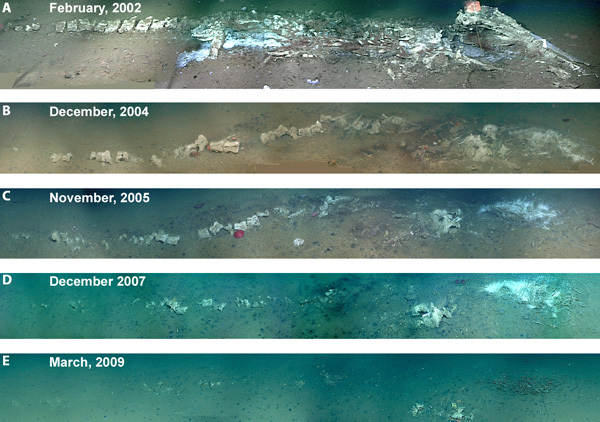 The research team also studied how the animals at each whale fall changed over time. Like previous researchers, they found that, during the first few months after the carcass reached the seafloor, a few species of scavenging animals, including sharks, hagfish, rattails, and crabs, removed flesh from the whale bones. As the flesh disappeared, a more diverse collection of animals appeared, including some that fed on whale bones or on seafloor bacteria, as well as predators that hunted animals attracted to the carcass. Overall, however, the Monterey whale-fall communities did not seem to progress through a well-defined or consistent series of stages, as had been observed at other sites. In fact, each of the whale falls followed a different sequence of community development, involving different key species. There were, however, similarities between the animal communities observed at similar depths. 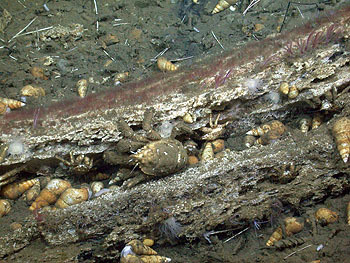 For example, the whale falls in shallower water were sometimes surrounded dense swarms of tiny, shrimp-like amphipods. In the same way, whales at similar depths were colonized by similar species of Osedax worms. But it turns out that Osedax worms are not the only animals that eat whale bones. In a recent paper in Biological Bulletin, MBARI researcher Shannon Johnson describes two new species of bone-eating snails. One of the new snails, Rubyspira osteovora, is the second most abundant animal (after Osedax worms) at the deepest Monterey whale fall. Johnson and her colleagues are still trying to determine if these snails can digest whale bones directly or require the help of “symbiotic” bacteria. If Rubyspira snails do not require symbiotic bacteria to digest bone, they would be the only known marine animals capable of surviving on a diet of bone alone. They also appear to be “living fossils,” representing a lineage that survived from the time of the dinosaurs (the Cretaceous era). With all of these worms and snails feeding on them, whale carcasses in Monterey Canyon do not seem to last as long as those observed elsewhere. 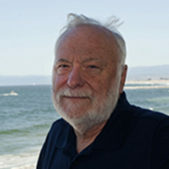 Lundsten’s paper suggests that the whale carcasses in Monterey Canyon will completely decompose in less than 10 years. In contrast, whale carcasses studied off Southern California may survive for 50 to 100 years. 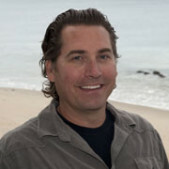 Lundsten and his coauthors suggest that the Southern California whale carcasses last longer because: 1) They lie in deep basins where the seawater contains very little oxygen (and thus fewer Osedax worms); and 2) They are mostly adult whales, which have thicker, more heavily calcified bones, whereas the whales in Monterey Bay were mostly juveniles. L. Lundsten, K.L. Schlining, K. Frasier, S.B. Johnson, L.A. Kuhnz, J.B.J. Harvey, G. Clague, R.C. Vrijenhoek, Time-series analysis of six whale-fall communities in Monterey Canyon, California, USA. Deep Sea Research Part I: Oceanographic Research Papers, 57(12), December 2010, 1573-1584, ISSN 0967-0637, DOI: 10.1016/j.dsr.2010.09.003. S.B. Johnson, A. Waren, R.W. Lee, Y. Kano, A. Kaim, A. Davis, E.E. Srong, R.C. Vrijenhoek, Rubyspira, new genus and two new species of bone-eating deep-sea snails with ancient habits. Biological Bulletin, 219(2), 166-177, October 2010.